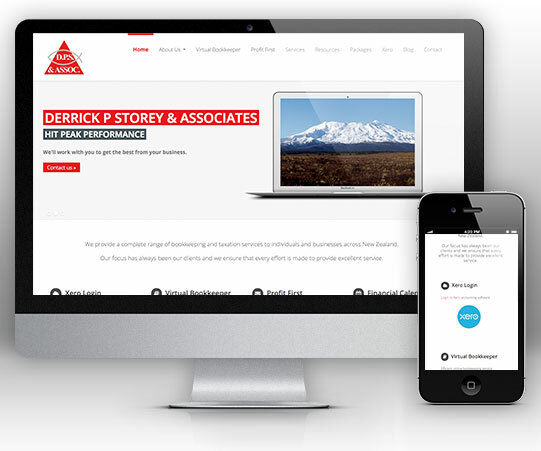 How former New Zealand Bookkeeper of the Year, Derrick P. Storey & Associates transformed his online marketing with Bizink. This problem was familiar to Derrick Storey of New Zealand accounting firm, Derrick P. Storey & Associates. He’d been with a popular provider of websites for accountants but was finding their product and service was not delivering for him. At first, Derrick tried to take the problem himself. He knew things needed to improve but lacked online marketing expertise or the time to learn it. So he made the decision to get help elsewhere. When it came to changing web providers, smooth transition was a priority. Although only a small bookkeeping and accounting practice, Derrick P. Storey & Associates look after around 150 clients, some of whom have been with the company for many years. Derrick wanted to make sure his clients were not affected by the change. Derrick was looking for the whole package from a new website provider: a fully utilized and responsive product and great customer service. And, perhaps a little extra – updates and resources to improve his technical ‘know-how’. Simply, a solution to meet all his needs without having to liaise with different companies for different things. Making the most of the features that help him automate much of his online marketing, Derrick is also enjoying increased website visits. Asked what features are the most helpful to him, he says: “There are two main aspects that pleased me the most about changing to Bizink. Firstly, the blogs they create for you. When you publish a blog it also sends out an emails to your clients and prospects. Use professional web services. This helps you concentrate on your main accounting priorities. Make sure your customers are not affected by a change – choose a company with a reputation for smooth transitions. There’s always room for improvement. Even if you think your website is running well, online industries change very fast. Make sure you ask for professional advice on how to improve your website, get a second opinion or ask for a website usability test. Make sure your web provider gives you a real working relationship and ongoing support, not just during the implementation or transition phase.